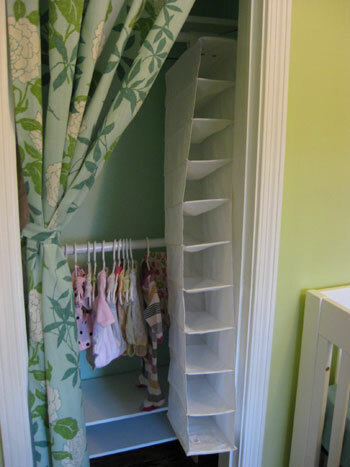 As you may remember, our nursery closet left a lot to be desired. Yup, this tiny nook (which can’t be expanded thanks to ductwork on the left and the back of our living room fireplace on the right) was in need of a serious upgrade. But we were determined not to spend over thirty-ish bucks to take it from terrible to sweet and organized. What? We’re cheap. First my smart (and surprisingly design savvy) hubby suggested that we paint it the same soft aqua color as the ceiling to make it a bit more fun- especially since we removed the door because it constantly banged up against the main door to the room (check out the rest of our nursery paint job right here). Then we put the original clothing bar and shelf back in and painted them a nice crisp semi-gloss white color. 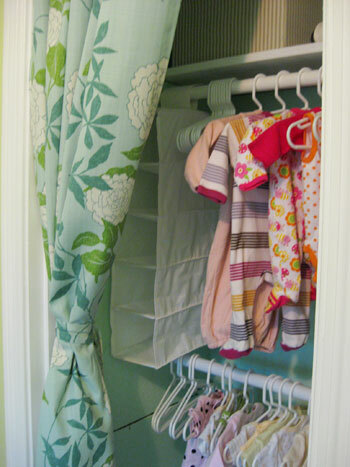 And next we hung a little homemade curtain to instantly cute things up (see how we DIYed that right here). 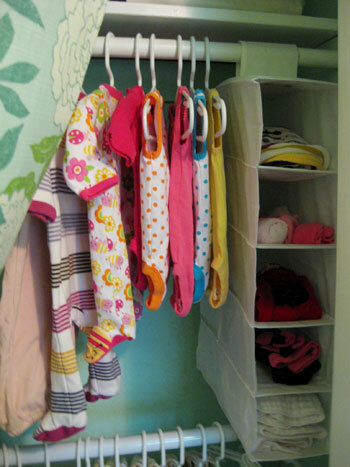 Now granted we hung every single item of baby clothing that we have so far- many of which we’ll probably store folded in our newly refinished dresser (our friends and family are insanely generous). 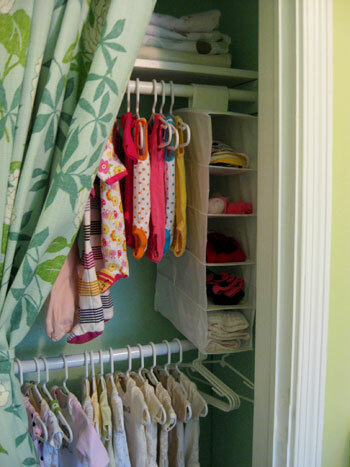 But we just couldn’t resist the urge to fill the bean’s closet up with her pint-sized clothes after we added a bunch of organizational systems – you know, just to see if they worked. … and now they work like a charm. They can be used to house everything from bibs and stockings to onesies and little undies and even socks and burp cloths. 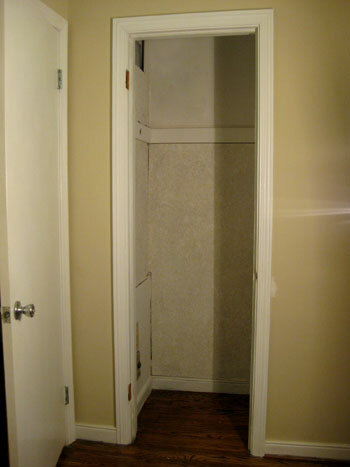 Again we’ll probably put a few of those things in our newly refinished dresser but it’s nice to know that our closet not only has space for hanging items but also has small cubby holes to tuck other things into. You’ll also see from the picture above that we stashed a little striped fabric storage box that we already had around the house on the left side of the top shelf of the closet (that’s also empty but we figure it can be used to corral everything from toys or books to extra linens or even blankets when the need arises). And on the right side of that shelf you can see from the photo below that we just folded four of the blankets that we’ve already received (I’m telling you, our friends and relatives are too kind) so they’re easy to grab at a moment’s notice. The bottom portion of the closet consists of that added second hanging bar that we mentioned (from Home Depot by the way) and a little double tiered shoe rack from Target (which we’ll probably use for Baby P’s shoes when she gets bigger someday, but currently functions as a place to store rolled crib sheets and changing table covers along with even more blankets (the beanette will never be cold!). 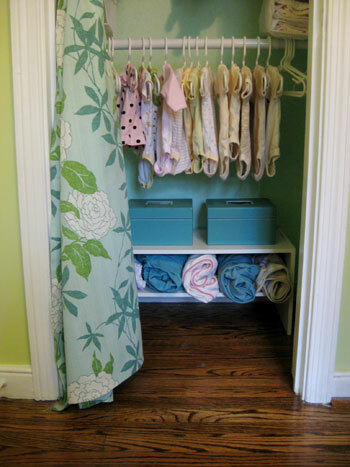 You’ll also notice those two blue fabric boxes on top of the shoe rack. They’re actually things that I’ve had for years (originally from Crate & Barrel back in my NYC days). And although I used to use one to store my sewing supplies (aka: a few rarely-used spools of thread and a plethora of iron on Heat & Bond tape) and the other to store iPod cords and other electronics, it was easy to find another box for those items since their punchy turquoise color fit so perfectly with the rest of the nursery. So now they too are empty, but we love that they can easily be used for toys or crayons or legos down the line. Empty bins and boxes = room to grow. Note: we also have a third one, as seen in this post. And speaking of room to grow, we love that there’s still a little slice of space under the shoe rack on the floor where we can tuck another set of bins and baskets or even store shoes and boots down the line. You know, when the bean’s feet actually touch the floor. Not bad right? Especially for something that started out looking so bleak. Plus even if we had to buy those hanging shoe organizers they’re just $6.99 a pop at Ikea, so with two of those we still would have come in at $32.34. 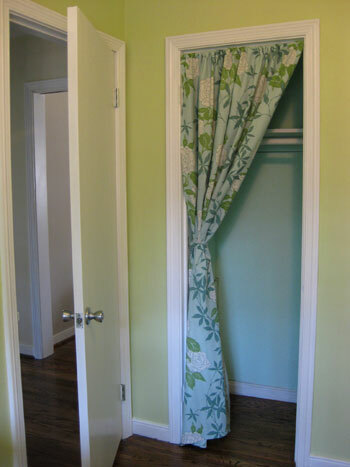 Of course that doesn’t include the price of the curtain (which we factored into this curtain making post) or the paint (although that was free since it was leftover from the ceiling). 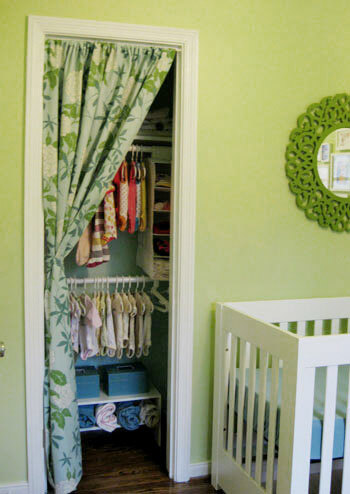 It’s definitely still a sliver of a closet, but with our big double dresser and a bunch of other storage options that we’ll be adding to the room we’re pretty sure that our baby girl will have plenty of places to stash her stuff. And speaking of stuff-stashing, have you guys used anything interesting or unusual to keep your closet organized (Hat boxes? Easter baskets? Recycled cereal boxes?). 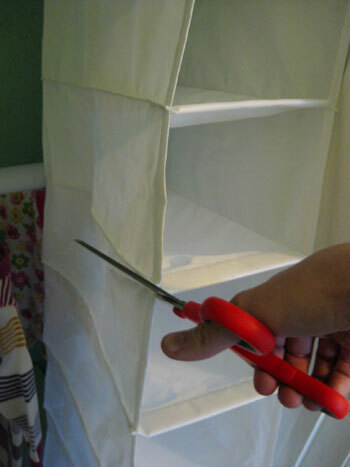 Or have you adapted anything to make it work (like cutting a storage system down to size )? Spill it. 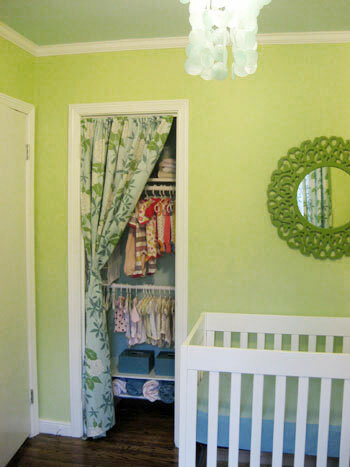 Psst- Wanna see our nursery progress from the very beginning? Here’s our painting post, our big shopping spree, our crib hunting rundown, our curtain-making tutorial, our fun little chair search, our mirror-painting extravaganza, our DIY faux sheepskin project, and our big dresser makeover (and subsequent drawer lining project). Good times.